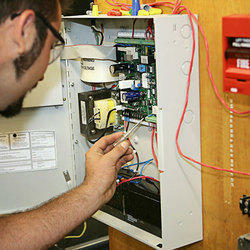 We are providing the Sprinkler Alarm Installation Service to our clients. As part of our services, we provide the installation of SprinklerAlarm Installation Service such as fire alarms, fire detection, sprinkler and fire suppression systems. Our staff of engineers design fire protection and suppression systems that are specific to your facility, that will detect and respond to fire conditions to ensure the safety of your occupants and minimal damage to your facility. Looking for “Sprinkler Alarm Installation Service”?